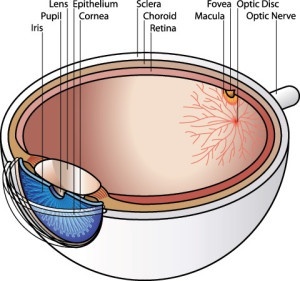 The retina, located in the back of the eye, contains several layers of photoreceptor cells (known as rods and cones). The macula, a term to describe the center of the retina, is the region of the eye that subserves central and detailed and color vision. The macula is cone-dominated (and therefore subserves daylight vision and color vision), whereas the remainder of the retina (i.e. non-central retina) is dominated by rods (and therefore subserves twilight and night vision). ; This activity is very demanding in terms of energy and nutrients. This high metabolic activity comes at a price (in the same way as high petrol consumption by a car comes at a price). The photoreceptor environment is necessarily rich in oxygen (because of the high metabolism of retinal tissue) and requires irradiation with visible light (in order to see, but which further adds to metabolic demands), and these twin stresses cause photo-oxidative damage (i.e. damage by free radicals).